All of these effects not only add that extra special touch to your day, but also create fantastic photo opportunities as well. 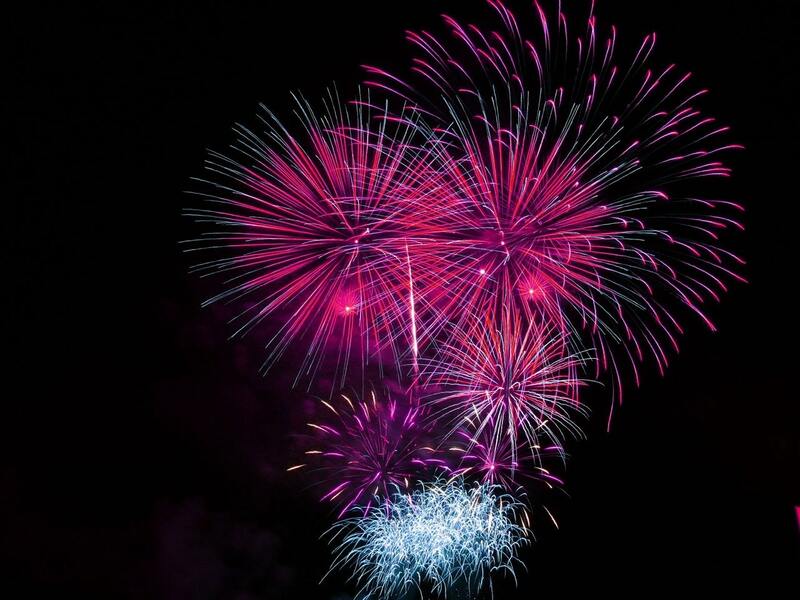 We can provide any of these effects as a stand-alone service, or as an addition whilst we're on site firing a Firework Display for you! When you book an Indoor Service with us, we will be in touch with you to discuss the options and understand exactly what you have in mind, and also with your venue to ensure we can safely stage the effect. Click here to book online! 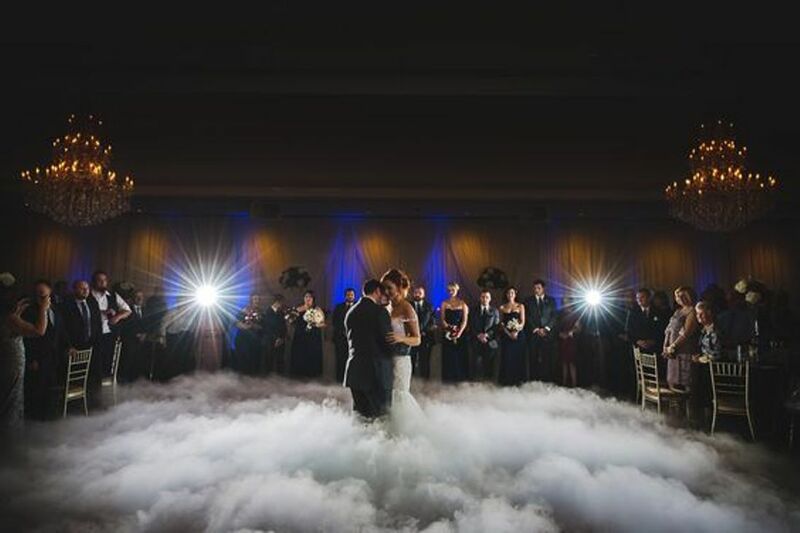 A stunning effect where your dance floor is quickly engulfed with this rippling low-lying cloud, for the duration of your first dance. And a breathtaking spectacle when the lighting of your DJ or band glows across the surface. We use actual dry-ice to create this effect instead of imitation fog, which immediately rises and fills the room with a haze. The cloud stays below knee-height, is not cold or wet, and simply disappears into the air. The effect is totally harmless - it is made by simply warming frozen CO2 (the gas we breathe out). It does not cause any breathing difficulties and will not affect any fire alarm systems. 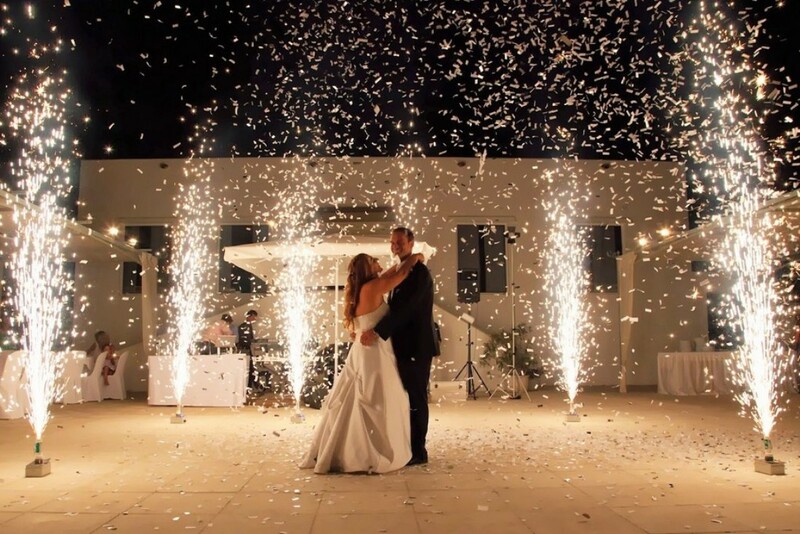 An explosion of confetti or streamers, exactly at the right moment, over your dance floor during your first dance, as you arrive at or leave your venue, or for the cutting of the cake! We have confetti available in a huge choice of colours, bi-colours or multicoloured. As well as in shapes such as hearts or petals. And with special finished such as metallic, glitter or ultraviolet. And biodegradable too for outdoor use. 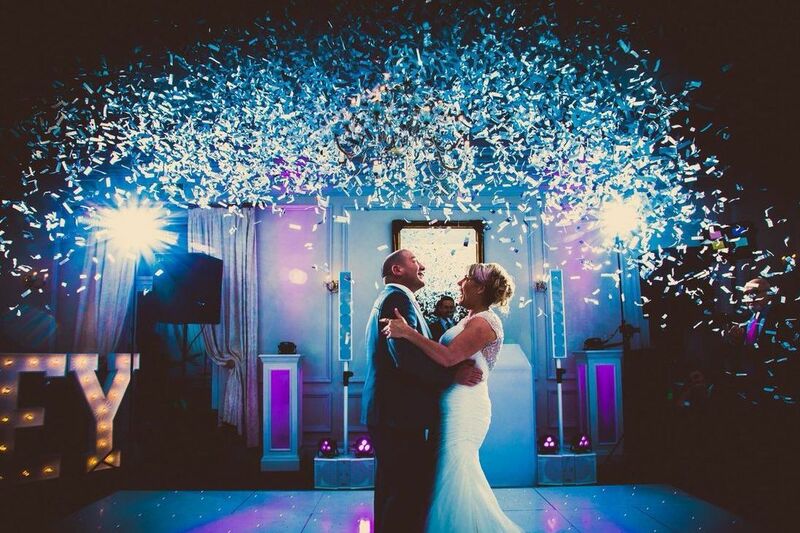 Our bursts of confetti can reach up to 8 metres, and streamers even further, dependant on the size and ceiling height of your venue. There is no gunpowder involved in this effect - the explosion is triggered electrically and uses a small cartridge of nitrogen gas (which makes up over 70% of the air we breathe). The noise this creates is similar to that of a bursting balloon. 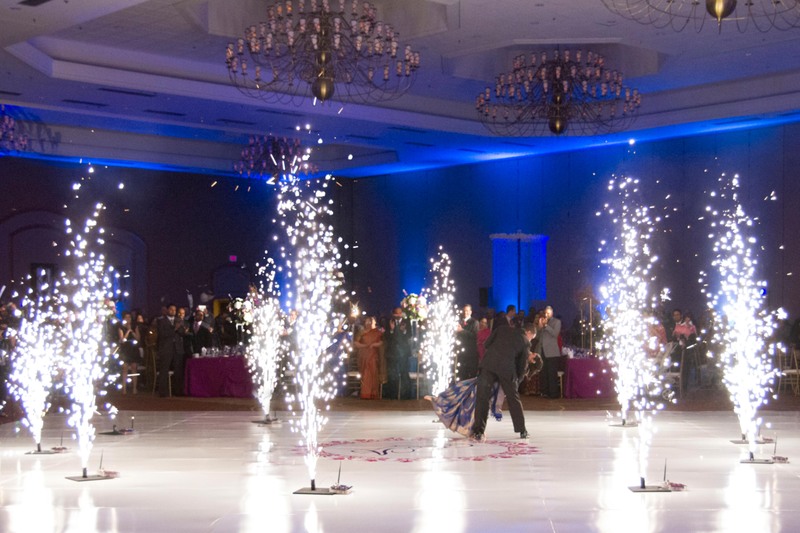 Fountain effect fireworks that are simply beautiful when several are fired at once - we can surround your dance floor, line the walkway, or position them across the front of your stage to create that amazing moment. Available in a variety of durations from instantaneous to 20 seconds, and in heights from 8 to 20 feet, to perfectly suit both the occasion and the venue. 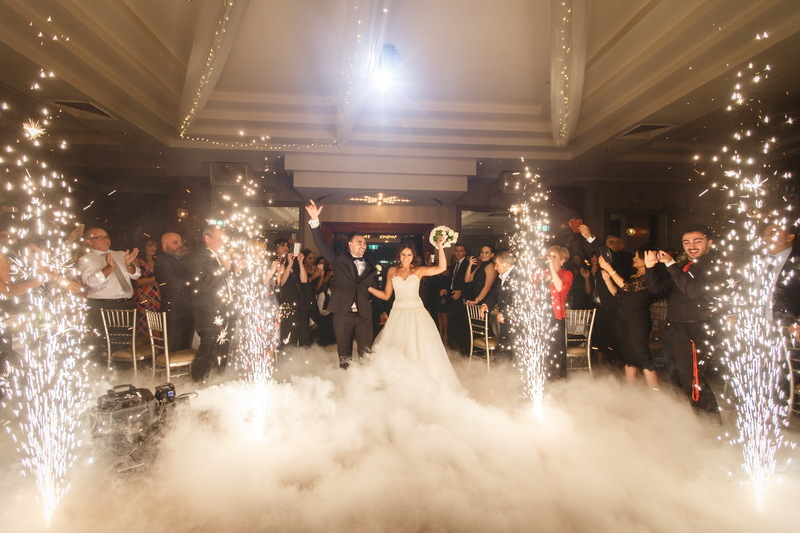 The "jet" type - which create a single burst of sparks - are very popular for cutting the cake or introducing an act to the stage; while the "gerb" type - which continue for a set duration - are brilliant for the first dance or walking through. The pyrotechnics we use can be positioned in close-proximity, due to the way they burn cold instead of hot. 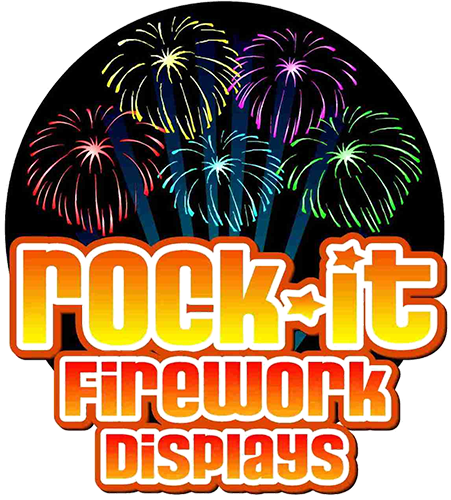 They are also called "virtually smokeless", because they have been manufactured with a different chemical composition to other pyrotechnics, meaning they produce significantly less smoke. As well as Silver, we have fountains with a coloured-hue too. 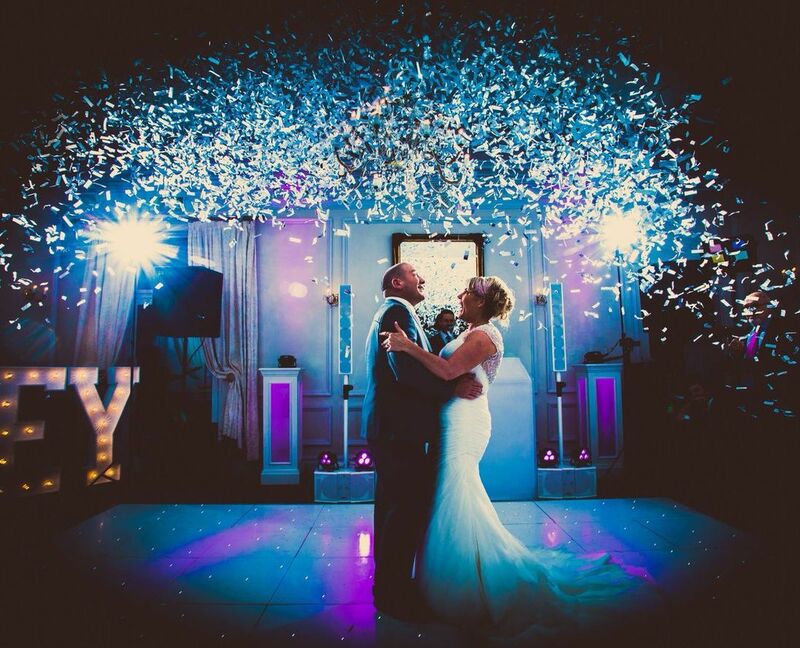 We have a whole range of different firework effects for use indoors, to make that special moment just right. In smaller venues we have Flashbursts, Glitterbursts and Coloured Flames in addition to our Fountain fireworks. And for large venues with a high ceiling and lots of open space we have Flame Projectors, Mines, Multishot Comets, Line Rockets, Waterfalls and Saxon Wheels. The possibilities are endless! 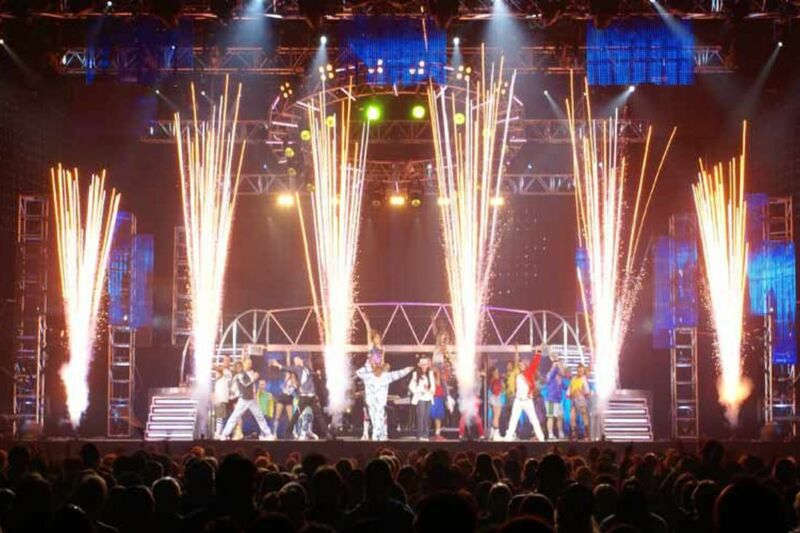 We can create whatever effect you are looking for, and we visit your venue and complete a risk assessment as standard to ensure it can be staged safely. From pyrotechnics that can be positioned in close-proximity to those for arenas. And from effects that produce intense heat or noise, to those that are almost silent or almost smoke-free. Contact us to discuss what you have in mind!